Since the majority purchase of the Brawn GP team after the 2009 season, Daimler-Benz has been struggling to get a grasp on the recipe for front-running team status in the world's premier open wheel racing series. In two full season, the new generation Mercedes GP group have been winless and without a Formula 1 pole for the constructor. Despite flashes of brilliance from the squad's all-German driver line-up of seven-time world drivers champion Michael Schumacher and Nico Rosberg, Mercedes GP steered into the 2012 Formula 1 season still searching for the vital pieces to grand prix racing success. At this weekend's Grand Prix of China, the third Formula 1 race of 2012, Nico Rosberg helped Mercedes GP conquer at least one of those important milestones. In qualifying for Sunday's Chinese Grand Prix at the Shanghai International Circuit, the Mercedes GP W03 race car were at the top of the time sheet through the crucial Q3 session. With a 1-minute, 35.121-second lap time, Nico Rosberg cycled the 5.451-kilometer Shanghai racetrack with the best lap of the 10 immediate challengers in the final qualifying round. Rosberg was more than half second faster than the second-fastest race McLaren-Mercedes machine driven by Lewis Hamilton. The first pole for the Mercedes GP race team since its return to Formula 1 as a constructor, the success in Chinese Grand Prix qualifying is the first for a factory Silver Arrows squad since the 1955 Italian Grand Prix. 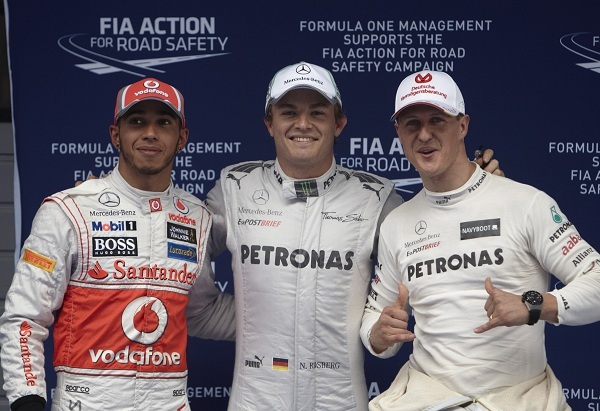 Driver Nico Rosberg also scored his first career Formula 1 pole in 110 races competing on the grand prix schedule. “It´s a very special day for me because this is my first pole in Formula One, and the first for a Silver Arrow since 1955." said Rosberg in post qualifying. Putting extra garnish on the performance of the Mercedes GP team in Chinese Grand Prix qualifying, Michael Schumacher scored a third-fastest time. More impressively for Mercedes GP is the fact that an early race weekend gearbox change penalty on Lewis Hamilton's McLaren car allows Schumacher to be promoted to the front row of the grid alongside Nico Rosberg. With the majority of Chinese Grand Prix drivers and teams waiting until the last 3 minutes of the Q3 session to secure a top time, some of the front-running teams did not obtain the grid position they were hoping to have heading into Sunday's main race. The top-running Red Bull-Renault is Mark Webber who only collected a 7th place starting spot. Sebastian Vettel and his team embarrassingly missed the Q3 session altogether with a 11th fastest time. The Reigning Formula 1 champion has been fighting hard in this early 2012 season to find speed with his Red Bull Racing RB8 vehicle. Scuderia Ferrari, the winning race team at the wet and tricky Malaysian Grand Prix event, had less to celebrate in Chinese Grand prix qualifying. Fernando Alonso barely broke into the top-10 with a 9th fastest time. In the same Saturday Formula 1 qualifying group at Shanghai International Circuit, Felipe Massa clocked the 12th quickest time. As the season is progressing, worries continue for Massa's future with the Ferrari Formula 1 racing team. Some rumour have indicated that current Sauber driver Sergio Perez could takeover the second Ferrari race car for 2013 or sooner this season. Mentioning the Sauber F1 team, the race squad continues to impress grand prix crowds early in 2012 as a refreshing addition to top-5 contention. With Sergio Perez delivering a high-profile second-place performance last race in Malaysia, the Mexican qualified 8th for the China race. Besting his teammate, Kamui Kobayashi showed off his understated skill by qualifying 4th behind Mercedes powered Formula 1 cars. In fifth place for qualifying, Kami Raikkonen has placed his Lotus F1 Renault close to the front as the Finnish driver continues his reintegration with Formula 1. Teammate Romain Grosjean also posted a respectable 10th fastest run. Grosjean is still struggling to finish a grand prix in 2012. The Lotus F1 team has been connected to some interesting rumours this past week where its future in Formula 1 was in question. Group Lotus responded to blog speculation as "rubbish" declaring they're staying with the series until at least 2017. The third race of the 2012 Formula 1 season, the Chinese Grand Prix is set for 3PM local time and 3AM Eastern time. Lewis Hamilton will be assessed a five-grid position penalty for a gearbox change. Will start 6th in Grand Prix of China.